An Ophthalmologist is a physician who has trained in the medical and surgical treatment of eye diseases. After four years of college, four years of medical school, four to five years of clinical training, and sometimes several more years of subspecialty training, an ophthalmologist must pass an oral and written examination to be certified by the American Board of Ophthalmology. An ophthalmologist is able to diagnose and treat problems which are visual (prescribing glasses, fitting contact lenses, performing refractive surgery), medical (ie. monitoring for and treating eye disease associated with diabetes) and surgical (ie. performing surgery to remove cataracts or treat glaucoma). 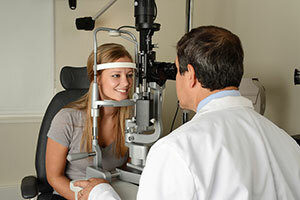 An Optometrist is a health care provider who attends a four-year school of optometry after four years of college to learn how to treat visual problems. An optometrist is trained to prescribe glasses, fit contact lenses and evaluate the eye for abnormalities. An optometrist must be licensed by the state, and some states allow optometrists to prescribe medications to treat certain eye conditions. An Optician is a technician who assists in the preparation and dispensing of devices to improve vision, including glasses, contact lenses and optical aids. A state license is not required.